Want a better spot to check the ATV race action? Just take the chair lift. A new kind of TT GNC? With all the talk of the GNCs being televised in 2002, promoters need to step up big time with their facilities and their programs. You know I say what’s on my mind — if this years’ series was televised it would have done more harm than good to how ATV racing is looked at by the millions of mainstream TV viewers out there. I want a modern day facility — civilization, spectators, tons of restaurants, hotels, nearby attractions and more. Ski resorts tend to accommodate a lot of people and they have what I’m looking for as well as lodges, possible theme parks, swimming, beaches, arcades, golf courses etc. No more leaving grandma at home. This makes a GNC visit more like a full out family vacation! I may be a little greedy here but I’m sick of primitive – Nowhereville, USA Nationals. I know there are plenty of powerful people in the industry badly wanting to separate the series. And they want the new series by 2003. Doug Morris of the ATVA said that this 2002 season will more than likely remain the same but a big change is in order for 2003. 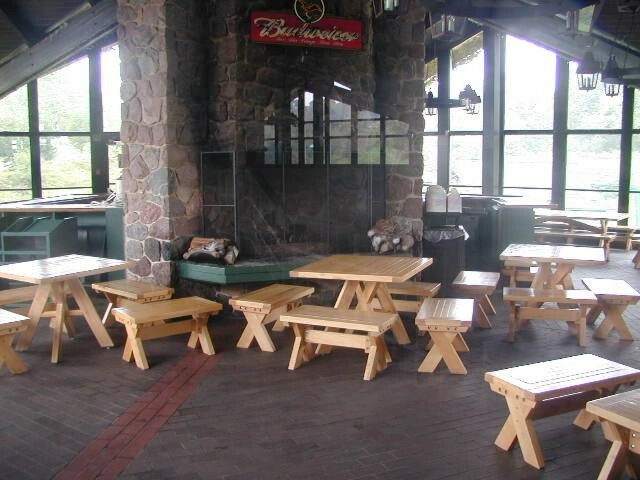 Kick back and enjoy track side dining at the bottom of the ski hill – race track lodge while you wait for your race. I think it’s time to skip the dust, and leave the primitive far-off wilderness type tracks for fishing and hunting trips.I think a system needs to be built that wont mess with the roots of our sport. I feel that the national champion should still excel in both TT and MX in order to be crowned a GNC champ. 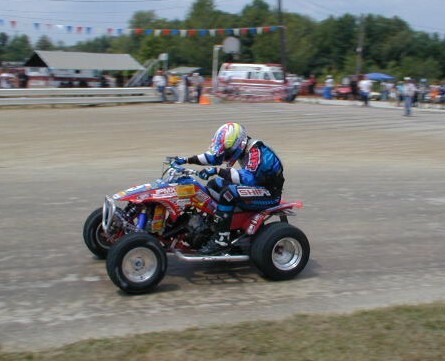 Many think that the TTs are slowing down the growth of ATV Grand National racing. I have to admit, I tend to agree with them on some of their opinions. With that said – I’m prepared to launch a whole new light to TT racing. I think some drastic changes to the TT programs are definitely in order. With threats of separating the series — I think this is the perfect time to introduce something different like a grass TT. I’ve heard from many low budget racers that have trouble with the cost of setting up a competitive TT race machine. With this type of TT race, I don’t see any need for McCreary or Hoosier tires (who by the way have never once bothered to lend a dime to our sport after years of countless attempts of well thought out sponsorship packages). I’m guessing that the many budget type racers, the heart of our industry, that tend to sway away (pun intended) from the TT rounds of the series will probably lean toward participating in grassroots (pun intended) events like this. In other words, I think the ski resort TT National idea might pull the “motocross only” type of ATV rider into the series and into this new type of TT racing. Once they try it — I know they’ll be hooked. The track layout would wind up and down the hill utilizing off cambers and natural TT style jumps. Lap times would be at least twice as long as current TT tracks. The pro program would be held under the lights in front of thousands of spectators throughout the hill, including those being waited on in the restaurant lodge area. 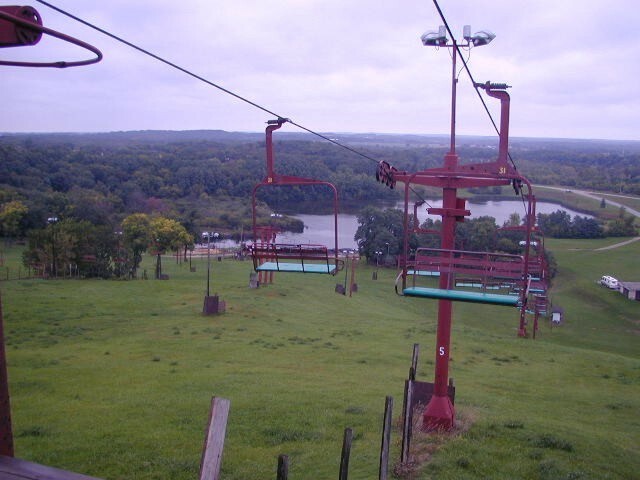 Those spectators wanting to broaden their spectating ability can easily take the chair lift to the top of the hill. Picture Mt. Morris with much smaller jumps, and a fresh grass race surface — kind of the Unadilla of ATV TT racing..
What do you guys think? Is this something you might like to see on the GNC circuit? Have I lost my mind? E mail me your thoughts here — ski resort TTs? Photos by Bill “WBGO” Lanphier, Michel Thomas, Philippe Viennet from the PVD website. This year’s 12 hour enduro race marked the 15th anniversary for the event. This year’s event held on Sept 2 brought some 120 teams from 15 different nations! As always the event was scheduled for 4 sessions of three hours of racing in each. This year rain messed that up and the night session was canceled. The Winrow/Eichner (UK/USA Team Duncan Racing/Roll Design/Golden West/IMS) won all three of the sessions to take the overall on a Duncan Racing-powered Yamaha Banshee prepped by the UK’s Martin Fletcher. This same team won the 2000 event as well. The French Lamet/Tusset/De Palma took the runner up spot on a Honda Laeger’s 330R. Country Rockin’ & Racin’ — Build it and they will come? — Not! Only 60 riders showed their ATV spirit and got involved in the first ever translation of top notch country music and high flyin’ ATV racing. Regardless, those that did attend got double time on the beautiful hillside motocross track in southern KY. Racers raced a total of 4 motos. Except for the big $10,000 pro race, this was ran in a heat and a main event fashion. 16 riders put their race face on and eagerly awaited the gate to drop. Shane Hitt quickly pulled to the front but was passed by Dana Creech just as fast. 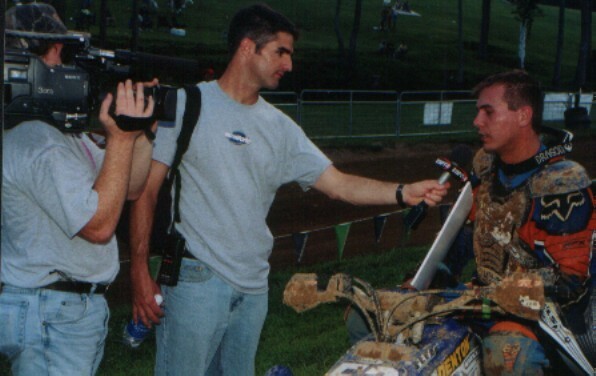 “We need to have a few events like this in California”, says Kory Ellis, who won the 1st ever ATV Rockin’ & Racin event and the five grand that went with it, to Lee Burrows and the ESPN2’s MotoWorld camera.Creech dominated the main event for more than half the race with Shane “Dog” Hitt keeping him in check in the two spot. Hometown hero, Jeremiah Jones trailed in the five position with a goggle problem. Jones would later charge to a hard earned second place. Hitt pressured Creech and spoiled his hopes to lay claim to the five grand awaiting at the finish. The two got tangled up while dicing it out in a sweeper. While they yanked back and forth to free up themselves, Powroll’s Kory Ellis cruised by, held the lead for two laps and took the big win in front of a fleet of media cameras and about 2000 spectators cheering from the nearby hillside. As for the “Rockin’ portion, the KY Headhunters and Sherrie’ Austin treated some 3000 fans that did indeed dare to venture from Edmonton, KY and nearby counties to show their appreciation to their hometown Headhunters. All in all, the weekend rocked and raced with style and success. The beautiful Sherrie’ Austin said she would like to ride on an ATV sometime. Any volunteers to give her a ride? Special thanks are in order to Mr. Ray Christy and his brothers and sisters for their endless help in running the event with me. Together, we promoted and ran the event from start to finish extremely well in spite of many disasters created by track manager, Scott Gentry, along the way. Another note of appreciation goes out to Maxxis Tires, Scott USA, Baldwin Motorsports, Outerwears, Lone Star, ATV Sport, Trackside Software, Trackside Graphics, Legacy ATV, H-Bomb Films’ Wes Miller, ATV 4-Wheel Action’s Adam Campbell, ESPN-Moto World’s Lee Burrows, Nik’s Pro X, Josh Starrett, Brett Harper, Kelly Straka, John Dains, and all the hard working staff members that also worked around Mr.Gentry. Be sure to read the November issue of ATV 4-Wheel Action for a detailed 4-page spread on the event. And watch Moto World on ESPN2 every Tuesday 5:30PM EST. The Rockin’ & Racin’ segment is scheduled to air on show number 42 Oct 16. However the piece might be pushed up a week. As for future Rockin’ & Racin events, another trip to Edmonton, KY is pretty much out of the question, but I know southern California rocks, rolls and races pretty seriously, maybe we’ll put one on in that area someday soon. He’s got a ton of pictures and videos from some race events including the recent Rockin’ & Racin’ Festival in Kentucky. Cannondale and Nac’s Racing have announced that they will cosponsor an ATV racing team beginning in 2002. The deal combines the first factory-level sponsorship from an ATV manufacturer with one of the most prestigious names in ATV racing history. The team will compete at all GNC and GNCC events in the coming year. Dana Creech has said “Thanks but, no thanks,” to being part of the Nac’s/Cannondale 2002 team. Creech, who was asked to help out Connecticut based Cannondale to torture test Cannondale’s newest innovations will opt to create his own race and freestyle program, (with major help from his agent and mom Teresa Creech). Creech says that the decision to go elsewhere is based on several reasons one of which was because Nac’s will no longer allow him to compete in any more freestyle events. Creech stated that he feels the way to bring ATVing into mainstream Motorsports is to incorporate ATVs in a way that will get airtime on TV. “We haven’t had much luck getting interest from networks with GNC racing so far, but the Freestyle events seem to attract a bit more attention to our sport.” Creech hopes that since the networks are there to cover the Freestyle events that the racing may just sneak into the broadcast when it is finally noticed. “We need to find a way to get our sport back into the general public’s eye so we can start to build a name like Supercross has done already.” Creech hopes to build a successful program with products he knows and trusts for their reliability and performance. Creech also mentioned that there may be a line of Freestyle accessories that are in the making. While Creech expressed his interest, respect, and enthusiasm for the Cannondale products, staff and company, and would have liked to be a part of their research and development staff, it looks like a pairing between the two is out for this season. Keith Little will also leave Team Nacs to more than likely ride for K&K ATV on a Sparks powered 250R. These two riders will definitely have other sponsors’ attention in the next few months. MX events for the GNC. Mainly to help the amateur riders that are going for a National title. What happens is they have to have stuff for two bikes, or the stuff to change over one bike to the other format as we did in 2000. Our finances in our family didn’t include purchasing and setting up a TT and MX bike (plus having a practice bike) to run the nationals. A lot of guys would be more interested in competing if they could choose a format and then focus on it. There are a lot of TT riders that ONLY do TT. The other thing is that most of the problems with the series in 2001 seem to have happen within the TT events. Maybe it needs to be its own program simply to please the majority of the participants in that particular sport. The other aspect of the TT/MX combined GNC is that we end up with a non-competitive points battle in all but the top classes. Basically to be a top five rider in say the 250B class (for example) all you have to do is show up and race all the races and you are in. It doesn’t say anything about whether or not you were a top-level rider, only that you could make it and produce some kind of a score at all the races. If it were a separate series, then I think you would see a major change in who your top-level riders are. 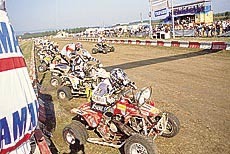 The GNCC stop at High Point Raceway in Mt Morris, PA is known for its great Moto X track. The GNCC guys got a change to hit the step-ups and doubles. As always the track had its share of hills, fields, and technical sections. Bill Balance took the holeshot but the thought of winning the race soon left his mind as his engine blew in the beginning of the race. Chad Duvall took the lead for a lap or so, but ended up getting a respectable 3rd overall. The gap between DuVall and Chris Borich, who finished 4th overall, was as close as 7 seconds at times. Ohio’s Jeff Seegott turned a few heads by charging from 18th to lead for a lap or so before suffering engine problems, which caused him to fade back to where he started. Kawasaki’s William Yokley finished the race 2nd, while Bradley Page went on to win the event. This was his second win of the season. To help those affected by the tragic events of September 11, 2001, the American Motorcyclist Association (AMA) has launched a campaign to raise funds for disaster-relief efforts. In addition to the T-shirt campaign, the AMA has designated Sunday, September 30, 2001 as “Motorcyclists United in Remembrance Day” nationwide. The AMA asks motorcyclists (and ATVers) to gather on this day to remember those who lost their lives, to support the survivors and relief efforts, and to honor America, in a way of their choosing. The 2003 Honda Rincon 650 is scheduled for a summer 2002 release. Honda just had their annual dealer meetings in Las Vegas. They disappointed us by not releasing their newest sport quad. Everyone knows they probably have a couple ready to roll like their liquid cooled 400EXR, but they didn’t think the time was right. In their defense, why would they release something new when they quickly sell every 400 EX they roll off the assembly floor. They did release the new Rincon 650 4×4 to go heads up with the Kawi Prarie and the Yamaha Grizzly. The big bore 4×4 market is really heating up to say the least. The new Honda looks like a major threat in the 4×4 sport/utility market. 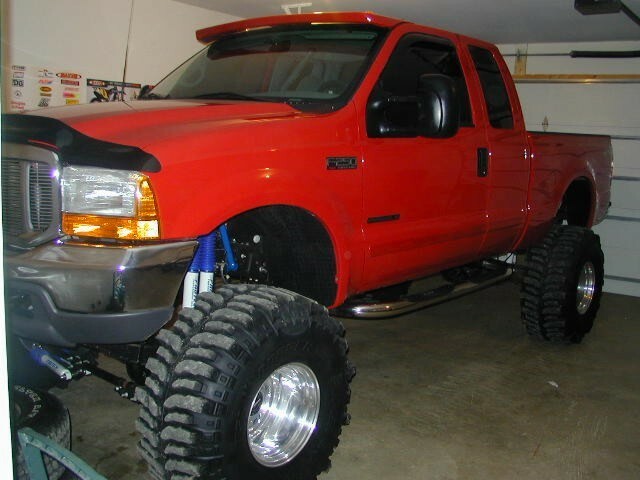 These big bore muscle 4x4s are getting lighter and faster every year! Maybe we should start calling this segment the 4×4 sport market. These machines are too fun to even bring up the word “utility”. Now days if a manufacturer doesn’t come to the plate with modern day technologies like liquid cooling, independent rear suspension, state of the art automatic trannies and more they’re left on the showroom floors while the big boys are out playing. I’m not sure what Kawasaki is up to, their dealer show was canceled due to the tragedies. I would think they have enough sense to not let the others completely take over on the hottest segment in motorsports today — the sport-performance ATV market. Suzuki’s dealer show was also canceled, so once again all we have is the rumor that the new Suzook will be ready for you in early April. Look for some pictures and the official word very shortly. For what it’s worth, I’ve heard that ex Suzuki factory racer Gary Denton has been helping the cause by lending his expertise. It’s reported that the 8-time champ thinks it handles better than a stock R, while the motor (probably a DR400 like the one Digger Doug raced this season on) hauls. Polaris claims to have a legit sport quad to go head to head with the Cannondale, Raptor and 400EX – we’ll see. They do a see a big future in the sport as they now have three youth quads in the new line up. No terrain is too torturous for Yamaha’s new Grizzly. Yamaha flew me to the Hatfield McCoy trail system in WV to ride their new Grizzly 660 4×4. You racer only types need to check out the 4×4 scene. It’s way cool and the new Grizzly makes it that much better. This thing handled like a sport quad but went everywhere a sport quad couldn’t. The 9.5 inches of independent rear suspension makes charging hard over extremely rough terrain a piece of cake. 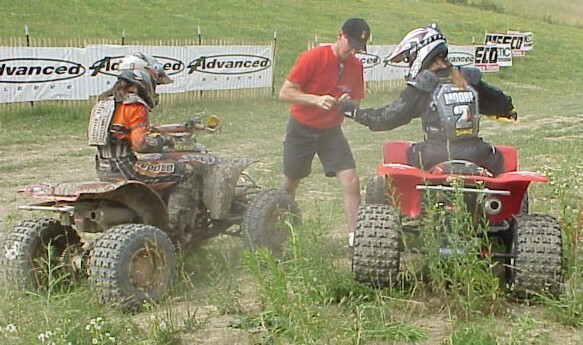 And I don’t think there has ever been a 4×4 sport/utility quad that had enough of a powerband to let you pitch it sideways on a powerslide to better track a sweeping turn like I could on the Grizzly. After beating the living daylights out of the machine for about 8 hours, it begged for more – and so did I. Thanks to the impressive Grizzly, I’m hooked on extreme 4×4 trail riding now. The GNC and the GNCC Awards Banquets are near. Show your support and attend! Check it out – Oct 20th is the Huevos 4 video premier party in Southern California. H-Bomb Films’ Wes Miller says this is his best video and this year’s premier party will top last years without a doubt. Crowds will exceed thousands, as heavy metal bands like Head will rock the place with an ATV extreme theme. You need to get your face in the place – especially now that round trip flights to SoCal are under $200! Check back for all the details on this yearly happening or call H-Bomb Films for more info at (949) 574-4800 ~ see ya there! Luburgh, seen here with his father Andy (this year’s +40 National Champion), will surely be on the hot list for sponsors wanting a good up and coming pro rider. Jason’s professionalism and genuine personality will make him that much more desirable to a major sponsor for the 2002 race season. Jason Luburgh of Cambridge, Ohio proved himself worthy of pro class competition with an extremely impressive rookie season. I noticed Luburgh made many smart decisions on the track. He doesn’t ride like a rookie, rather more of a season vet. His controlled consistent style reminds me of Tim Farr and Gary Denton – (pretty good company to say the least). Barry scored his first GNCC (bike) win ever when he captured the victory at the Matthews Farms GNCC in Taylortown, Pa.(across the street from the Hi Point). 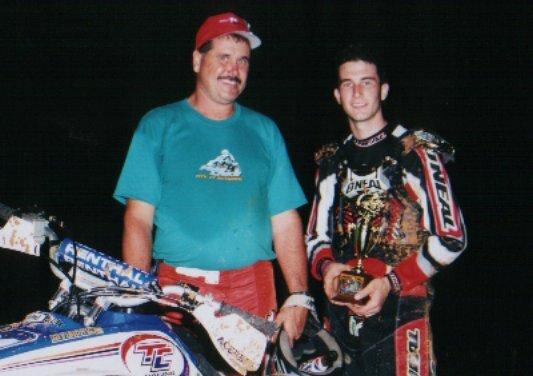 Hawk won 7 GNCC titles on his LRD Fourtrax, an accomplishment that may never be beat. Speaking of the GNCC Mathews’ Farm National – Jeff Russel and the Racer Production GNCC crew are what Steven Speilberg is to the movies! This track rocked! It had tons of places to pass, huge wide open winding fields, massive hillsides, creative option lanes through mud holes and plenty of new terrain. It was one of the worse cases I’ve ever had of rider’s itch – I badly wanted to race this one. If you missed it – don’t dare miss it next year. The 5 rider team of John Gregory, Gilberto Santana, Ruben Martin, Alberto Marquez and Cono Ramirez took no pitty on assaulting the rest of the competition in the Baja 500. The Duncan Racing/ Roll Design/ Golden West/ IMS team took the Overall ATV with ease. They beat the 2nd place ATV by over 45 minutes and placed 8th overall with Motorcycle and ATV’s entries combined. What’s more is the team ended the race in an extremely respectable 18th overall counting all SCORE entries, including the Trophy Trucks! After completing the 490-mile course, the team was officially clocked in at 11:52 minutes. You desert racers know how impressive that kind of time is. Picture perfect pits and zero problems – including zero flats. Kinda like a Michael Jordan 72-point game. Jimmy Stephensen and Eric Dollente of CT Racing teamed up to win the Tonopah 300 on June 23. The duo rode a CT/Kevin Avina Prepared Yamaha Raptor. Stephensen rode the last 25 miles with two front flat tires to take the victory. The American Airlines in-flight magazine has a short review of the Cannondale FX 400. It’s nice to see other publications taking note at the huge interest in sport performance ATVing. Dirt Wheels editor Steve Casper snuck away to England but didn’t tell us why. It seems he was on his honeymoon. A congratulations are in order. The two were married May 18th. We wish them the best. What’s the recent released movie – Tomb Raider have to do with ATVing? Most of the action shots were filmed by a dangling camera man balancing off of a tricked out utility quad piloted by Matt “The Kangaroo Kid” Coulter. Matt says it was a great experience being on the set for two months. He also enjoyed hanging out with Angelena Jolene. 1. Who was Yamaha’s first official ATV factory rider and what year was this? 2. Before Gust’s recent win, who was the last person to win a GNC on a Suzuki? Also, what year and at what event did he win it at? “We will rally the world to this cause by our efforts, by our courage. We will not tire, we will not falter, and we will not fail”. — Pres. Bush in one of the greatest speeches of our nation. – Sept 24, 2001. “The success we’ve been enjoying with ATVs has compelled us to prioritize the ATV production over the motorcycle production,” Chris Petron on Cannondale’s all American ATV lineup. That’s all for now. Next update much sooner – promise! The ATV finally catches up with modern day technology. 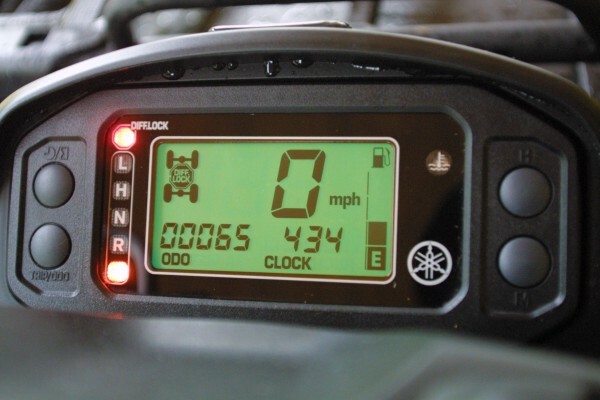 This is a shot of the dash board on the new ’01 Yamaha Grizzly. Girl Power! Angela Moore and Traci Lenig – two of the fastest females on 4 wheels (both are GNC and GNCC national champions) recently teamed up for the BUCCS race in northern Ohio (Buddy-Up Cross Country Series). The girl duo roosted a few guy teams in the competitive 4 stroke quad class. 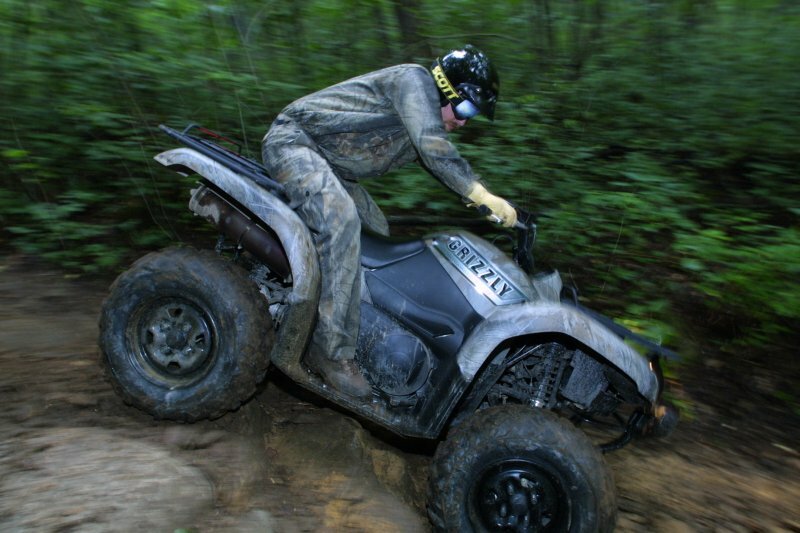 This from the Deep Creek Crossing competition at Victory Sport’s ATV Jamboree in Greeneville, TN. JJ wicked and tucked for speed at Ashtabula. Digger Doug (and Dozer Dog) show off their toy trucks. 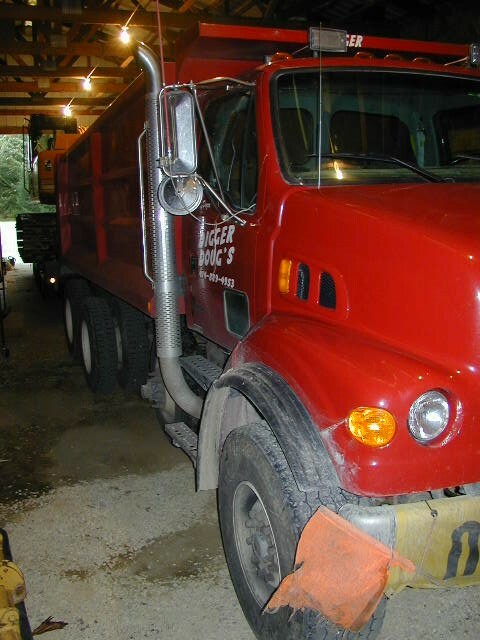 As seen below, Doug’s dump and trailered loader are so big they require an oversized permit to get to the job. 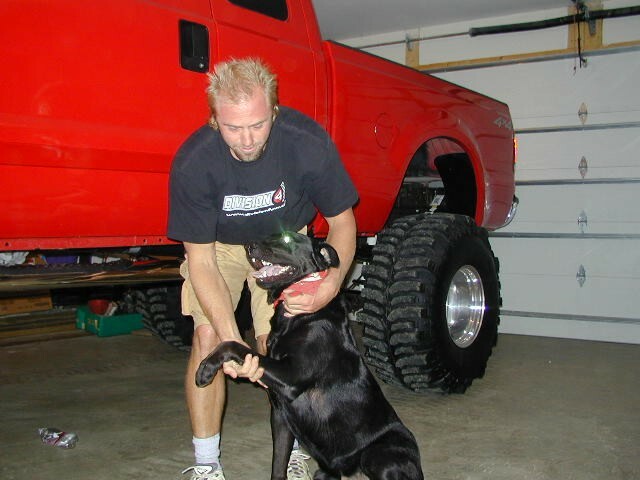 As for Digger Doug’s new pickup the pictures don’t do it justice. 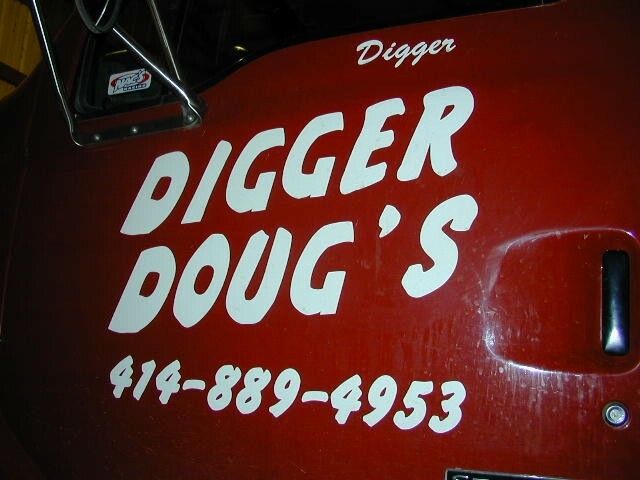 This truck is all Doug Gust!